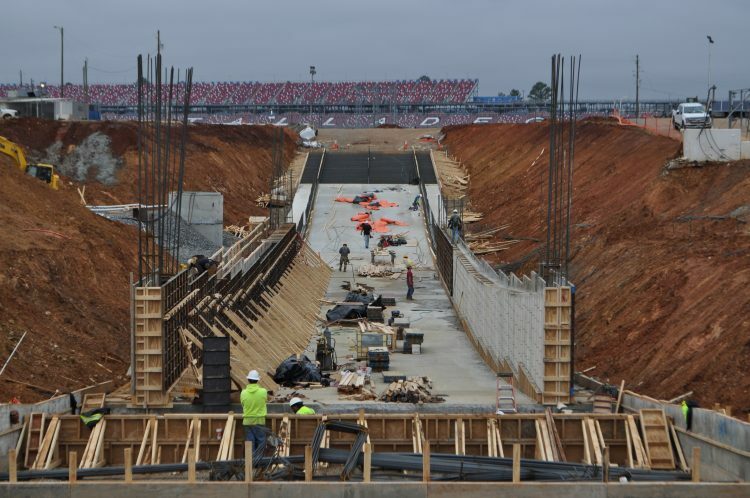 The hustle and bustle of the holidays are over, but not the construction efforts for Talladega Superspeedway’s new Turn 3 Oversized Vehicle Tunnel, the first development of the 2019 Transformation Infield Project. Crews worked through much of the holidays and the tunnel walls are now coming to life as a result despite battling a host of inclement weather. In addition to the walls, rebar and concrete pours continue for the extension of the tunnel slab (nearing the infield entry/exit access). Oxford, AL’s Taylor Corporation is spearheading the tunnel construction effort. The Oversized Vehicle Tunnel, which is scheduled for completion in time for the track’s April 26-28, 2019 spring motorsports tripleheader weekend featuring the GEICO 500, is the initial part of the approximately $50 million Transformation Infield Project that is part of International Speedway Corporation’s (Talladega’s parent company) long-term capital allocation plan and reinvestment into its major motorsports complexes. The new two-lane tunnel will be capable of allowing vehicles as large as race team haulers, fans’ recreational vehicles as well as track tram vehicles (to take fans who have both infield admission and grandstand seating) to enter and exit the track simultaneously with ease. It will be open 24 hours during event weekends. Also slated to be ready this spring is the 67-spot Finish Line Premium RV area (located just past the start-finish line & includes full hookups), as well as new Infield Shower Trailers. The culmination of Transformation will occur this October and will allow fans to be immersed into the sport of NASCAR with a one-of-a-kind Talladega Garage Experience, which will feature “up-close” access, interactive attractions and enhanced amenities for fans, sponsors, teams and stakeholders in the iconic Talladega infield. Fans can learn more about the project and view the progress 24/7 via the construction cam by visitingwww.talladegasuperspeedway.com/transformation.